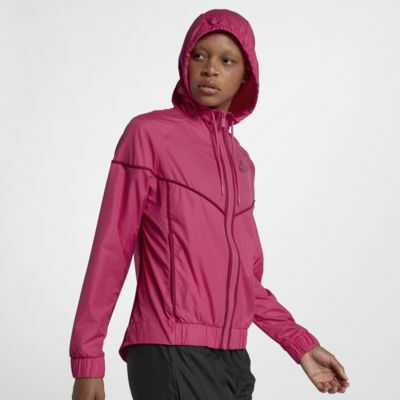 A legendary look gets a playful makeover with the Nike Sportswear Windrunner Windbreaker. Crafted with the iconic chevron on the chest, it features a paneled hood for warm coverage. Woven fabric has a smooth, lightweight feel. Chevron design for a classic Windrunner look. Fabric: Body: 100% polyester. Pocket bags/upper back lining: 100% recycled polyester. Fit as expected. My daughter loves it. She has two different colors. I bought this in January and I love the look of it. You can really wear this Windbreaker with anything. I personally wear it with my leggings. I would definitely recommend this product if you just really wanna stay cool. Fits great, love the color and style. I love that it's longer in the back.